Stephen King once said that to be a writer, you have to be paid for something you've written. I think that's a fair criteria for a "professional" photographer. The dividing line between enthusiast and professional is the ability to earn a living from it and, while that qualifies me both as a writer and a professional photographer, it relegates my landscape photography to the realm of the amateur. I've never been paid for a landscape. I've given them to people as gifts, and been asked for signed copies by friends, but I've never made a penny on them. They remain a hobby, albeit one to which I dedicate most of my energy. Taking pictures of people certainly isn't easy. It takes effort, charisma, timing. I get it. But landscape photography, in the right hands, is transformative. Look at Mitch Dobrowner, for example. He takes storms and southwestern landscapes and shapes them into postcards from hell, or venus, or somewhere. The potential of photography is to both record a moment, and mutate that moment into something entirely new. To freeze an image in time, and also create something totally unique. At its best, landscape photography exemplifies what's best about photography as an artform. You are recording, and you are creating. I am no Mitch Dobrowner, or Ansel Adams, or anyone for that matter. I started landscape photography in earnest about a year ago and, while I get better every day, I'm hardly what anyone would call an expert. I do it because I love being outside. Landscape photography conditions you to see the world in ways you never had before. Where you might once have just driven to work, you now notice the clouds, and the light, and the sky. It forces you to really look at the world, to wring the beauty out of every frame. Large format has proven to be the most extreme example of this, (a single large format exposure might take an hour to capture) but digital photography forces the same instincts to awaken. When my lady and I recently attended a wedding outside Ithaca, we stayed at a small bed and breakfast. Our first morning there, I climbed down to a small creek behind the house with my camera and a cup of coffee and took this picture. Is it a perfect photo? Of course not. I stopped down too far, so it's soft, would rather have had fall foliage, etc etc etc, but who cares? It reminds me of something lovely, and is a lovely image on its own. This is, to me, the gift of photography. Last summer, my father and I took a trip to British Columbia to visit friends and hike the trails north of Vancouver. While I captured plenty of beautiful images there, I'm struck by how many people prefer the photos I've taken of my own home town, Buffalo. The places I visited in Vancouver took my breath away, but I think my photographs of Western New York have a certain intimacy that maybe got lost in the grandeur of the Pacific Northwest. River behind a friend's farm in Kamloops, BC. I try to photograph my rust belt home like I would any beautiful scene. To wring the elegance from the decay. Buffalo may be getting nicer every day (it's true. I swear it is,) but the past still provides a powerful canvas for a motivated photographer. Lake Erie boardwalk, South Buffalo. 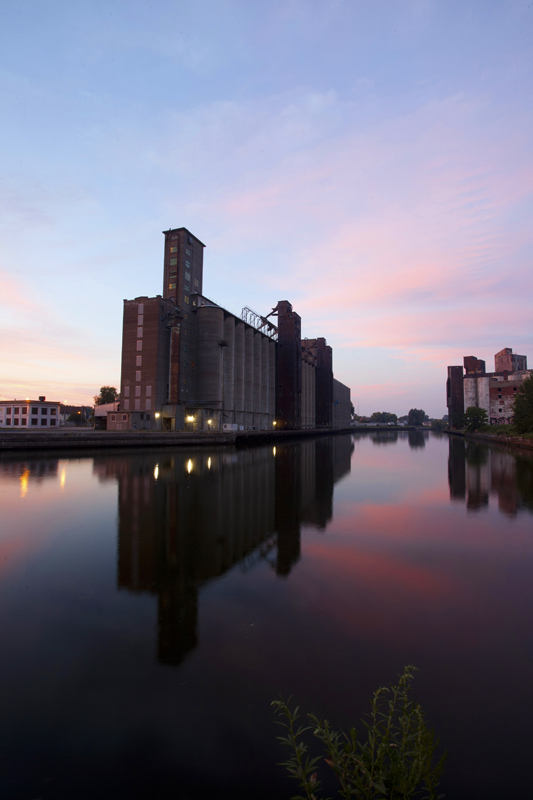 Last summer, a friend and I drove down to South Buffalo's decaying grain elevators to take pictures. We spent some time outside shooting, until it looked like the sun was about cooked. "Guess that was the show," I said, and we headed into the silo. It smelled terrible, but I got some decent pictures. As the light faded, we decided to head outside, where we were greeted by a glorious sunset. I took a few photos that night but when we looked them over, my friend pointed and said "that's the one." I think I might like this photo more than other people do, and that's fine, but when I look at it, I see everything I love about photography. Here's a moment, frozen in, and somehow beyond, time.